The CSUSB Recreation & Wellness Center (Rec Center) hosted its annual Celebrate EveryBody Week starting on Feb. 27 and ending on March 2. The event has been held every year since 2010 to promote positive self image. The Personal Training staff explained that the purpose of the event is to remind people that we come in all shapes and sizes, and to encourage body appreciation. 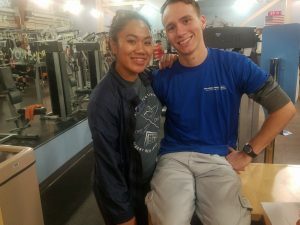 “We all come into the gym for different reasons, whether it is to lose weight, gain muscle, or relieve stress,” said personal trainer, Jennifer Item. “The event is to serve as a reminder to appreciate your body in whatever stage it is […] and for students to love themselves,” added Item. Throughout the week information and different activities were available for anyone interested, Item explained. She also discussed how they publish body positive affirmations for students to see. “During the event we write positive quotes on the mirrors on the gym floor to promote positive thoughts and deter the patrons from being to critical about their self image,” said Item. “Life is about perspective and it starts with you […] Love yourself,” read one quote. Free t-shirts and pledge cards were handed to visitors from personal trainers as well. Personal trainer Brady Collins explained that the event featured a lot of student involvement. The event is not limited to just students, but all faculty and staff. Active gym enthusiast Michael Allen believes that the event is a great way to promote inspiration to others. Allen believes that the overall message of Celebrate EveryBody reminds him and others the that they are not alone on their fitness journey through encouragement. “No matter how much you think you may be [alone] […] don’t allow others to scare you off when you are trying to improve,” encouraged Allen.